You're going to need this speaker a lot more often than you think. After all, your son has 50 of his closest friends pouring into your basement to celebrate his high school graduation, you have that fundraiser you're putting on at the local VFW hall, and you somehow got roped into providing sound at your company holiday party. These are just some of the situations that demand a capable all-in-one speaker system that can cover a large area with powerful, articulate sound, but is also easy to set up and flexible enough to handle a wide variety of inputs and auxiliary equipment. Total PA Ultra to the rescue! Here is everything you could ask for in a PA/presentation speaker system: A high-powered (500-watt) bi-amplified, equalized sound system driving a robust 15-inch woofer and 1-inch tweeter covers even the largest spaces with clear, vibrant sound. 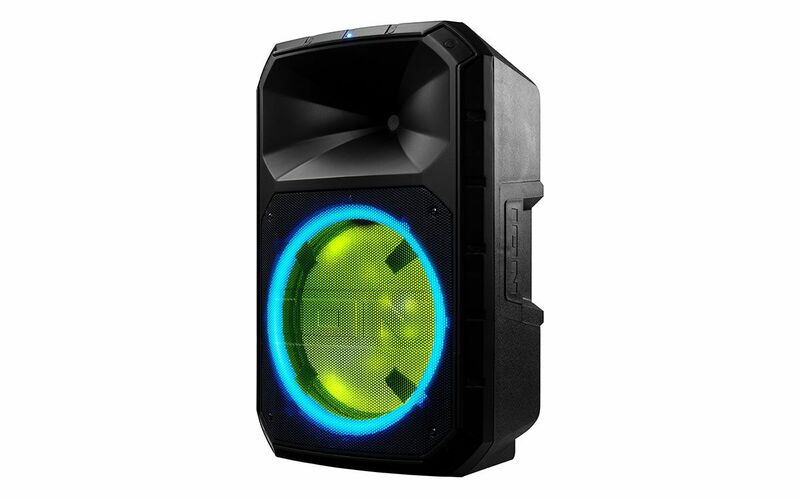 The woofer glows in multiple colors and has a special Dancing Circle of Light around the woofer for truly exciting visual effects. The speaker has a multi-channel mixer with two mic inputs and Master Volume control, plus remote control. You can wirelessly stream music from any Bluetooth® device, use the built-in music player to read music files using the USB port or SD card slot or take advantage of the on-board FM radio. The included microphone with echo effect is great for karaoke. Total PA Ultra has a telescoping handle and built-in wheels for easy transport and the included tripod stand elevate the speaker to optimum height.